One of my students suggested this book to me last year, and I finally got around to getting it from the library. If I was twelve years old again, I would have absolutely loved this book and been hooked for the duration of the series. It was fanciful, had a cute ending, and hit all the correct markers for decent kids’ fantasy, but the older I get, the harder a time I have sinking into YA fantasies, and this book was no exception. Our three main men, John, Jack, and Charles are all Oxford men who end up in the wrong place at the wrong time and land themselves on a journey to the Archepelageo, the world beyond the world, encompassing all the mythical and legendary places and creatures of earth’s literature. John finds himself the Caretaker to the Imaginarium Geographica, or the Archepelageo’s atlas, and he and his new-found friends must use it to navigate the Archepelageo in order to defeat the Winter King before he destroys all the islands and takes the Silver throne. There are adorable characters like Tummler the Badger, and we get to meet some famous literary peeps like Captain Nemo and the Goblin King, and Owen writes a very clever mix of biblical, legendary, and mythical stories that fit into the plot. In truth, there were a lot of great bones here, but I felt that it at once moved too slow and too quickly depending on the parts. We literally hit the ground running by page seven, and our three main men, who don’t really know each other, jump right into the action without a lot of introduction. We know that John’s on military leave from The Great War, that Charles is an Oxford editor, and Jack is going to be an Oxford student, but we don’t really get a sense of who they are, and aside from Jack, there isn’t much of a character arc for them as they move through the novel. It felt like they were more like ciphers for the fun plot to happen around. A few times, we get glimpses of who John is as a person, but it never went deep enough for me to truly care about his fate. But once we get to the Archepelageo, it’s a slow and arduous info-dump from standing around and expositioning on a ship, to sitting and expositioning in a cave, to sitting and expositioning on a desert island, before we finally get up and moving. I became excited about this book up around chapter 17, which is more than halfway through the book. Now, as a fantasy reader, I totally understand the slow lead up as we have to do world-building and the solidification of environment for our characters to continue on through the next few books of the series, but because I didn’t feel enough emotion for the three main characters, it was very hard to stick with this for the action. Personally, Eion Colfer does a similar story idea much better in his Artemus Fowl series, which I still love as an adult and can read over and over again. 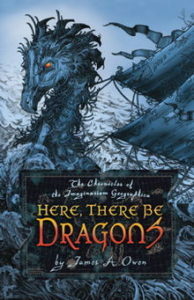 All that being said, one of the things I truly enjoyed about Here, There Be Dragons, was the beautiful line drawings done by the author for each chapter. They’re so detailed and artfully rendered, that I honestly would have preferred this to be a short-story picture book than a novel. 3 stars for clever plot and art, – 2 for info-dumping and not enough character development. Share the post "Here, There Be a Lot of Info Dump"